Imagine four young, bohemian artists renting a two bedroom apartment at the Jersey Shore for the summer of 2019. Imagine that it's Friday of Labor Day Weekend, complete with a power outage and a cold snap. 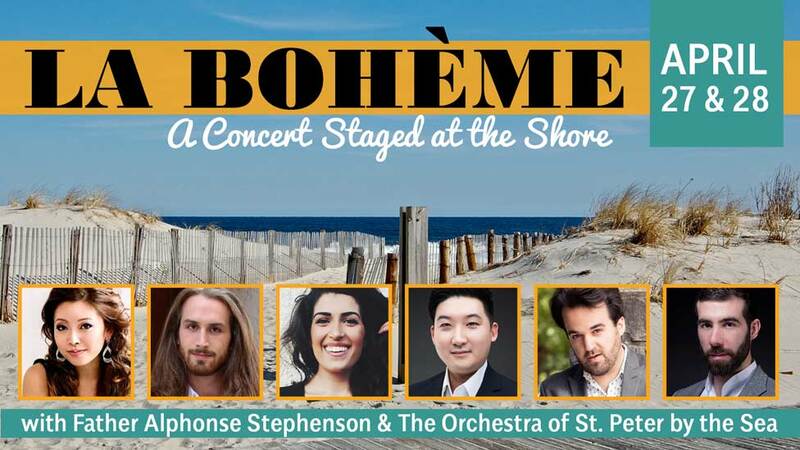 This is exactly the setting for this season's production of Puccini's much-loved opera La Bohème, a staged, costumed and recreated performance with the Orchestra of St. Peter by the Sea and its conductor, Father Alphonse Stephenson. "I know that updating an operatic masterpiece is a stretch for the imagination sometimes, but this concept is a natural," said Father Alphonse during a recent interview. "I've found the the best cast for our endeavor. They not only have magnificent voices, but they actually look and act like the roles they're singing!" Complete with supertitles, translating each not-to-be-missed dialogue and asides projected above the action, a full, forty-five member symphony orchestra, plus chorus of Labor Day Weekend boardwalk bar patrons, this promises to be an epic performance.